Since a gas leak erupted outside LA on October 23rd, over 83,000 metric tonnes of methane have escaped to the atmosphere, prompting public officials to evacuate the neighbouring community of Porter Ranch. But as a disturbing new analysis shows, a much broader swath of LA is now drowning in methane. The Home Energy Efficiency Team (HEET) is a Cambridge-based nonprofit that’s been shedding light on leaky natural gas infrastructure for years. Last week, HEET sent Boston University Professor Nathan Phillips and Bob Ackley of Gas Safety out to LA to measure pollution in the air surrounding Porter Ranch. Armed with a laser gas analyser that can sniff out airborne methane with parts-per-billion precision, Phillips and Ackley drove around the LA area measuring methane concentrations for a period of five days. Every time their analyser detected elevated gas levels, it plotted the numbers to Google Earth. The red bars on their maps indicate where they drove, with higher bars corresponding to higher methane concentrations. 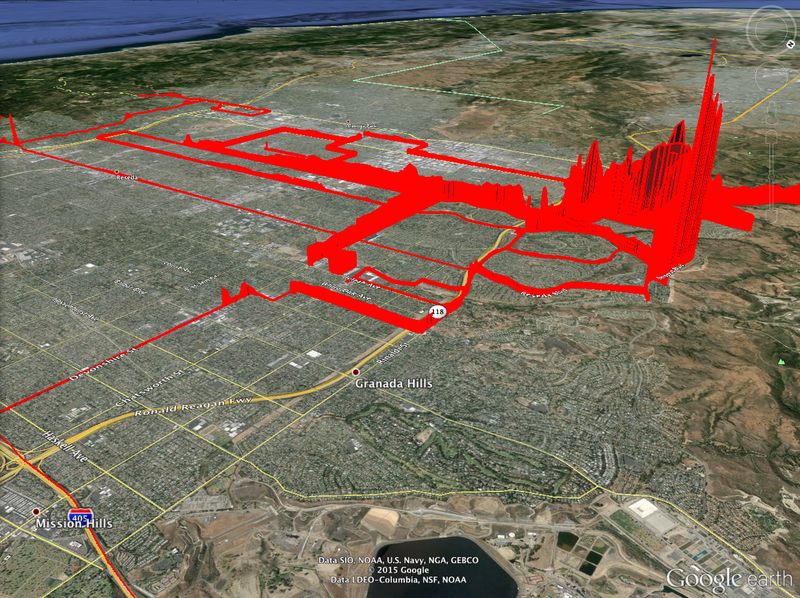 While California’s Air and Resources Board has been keeping tabs on the air quality directly above the ruptured well, HEET’s analysis went further, revealing elevated methane levels up to eight miles from the storage site. In a relatively unpolluted area like HEET’s hometown Cambridge, methane concentrations will typically fall between 1.85 and 1.95 ppm. In the region surrounding the Porter Ranch leak, concentrations of the invisible pollutant are two to up to 67 times higher. This shouldn’t exactly come as a surprise—after all, we’re talking one of the largest methane leaks in history here—but the new data may put added pressure on SoCalGas to expand the gas leak relocation area. So far, the gas company has evacuated over 2,000 residents living within a mile of the leak, who have reported dizziness, nausea, fatigue and other symptoms. Yesterday, Los Angeles City Councilman Mitchell Englander called on SoCalGas to extend relocation to adjacent areas in the San Fernando valley. The rate of methane leakage from the well has been steadily falling since late November, but SoCalGas says it could take until late February or March for the well to be plugged. The company is in the process drilling a relief well and plans to inject tons of concrete into the ground to seal it—sort of like filling an 8,000 foot cavity. In the meantime, methane is sure to continue its slow creep across the city.